This issue: measuring and setting the MoTeC Crankshaft Index Position. Last issue in Project Honda Insight, Part 11 - New ignition system and cam sensing I covered the crank and camshaft position sensors. The Insight’s crank position sensing system – 12 evenly-spaced teeth read by a magnetic sensor – was immediately compatible with the MoTeC M400 programmable ECU. However, the camshaft position sensing system – two teeth on the cam read by two sensors - was not. To allow the ECU to make sense of the standard camshaft signals, eLabtronics developed a custom electronics module. This module (that we dubbed the ‘Miro Module’) takes the signals from the two cam sensors, and then outputs a signal only when both cam teeth are simultaneously adjacent to both sensors. The output is a single square wave per camshaft rotation. 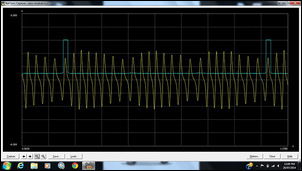 This MoTeC software screen grab shows the signals as the ECU sees them. The crank signal (yellow line) shows the waveform of the magnetic sensor – 12 teeth (and so 12 pulses) per crank rotation. The blue line shows the square wave output of the Miro Module. There are 24 pulses between the square waves, confirming that the module outputs one pulse per two crank revs. So with these changes, the ECU could now sense both crank and cam signals. But there was still an issue that needed to be resolved. The Miro Module outputs a signal once each two rotations of the crank – fine. But where in the crank’s rotation is this signal outputted? Is the leading edge of the square wave exactly at Top Dead Centre of cylinder #1 on the firing stroke? Or is it somewhere else in the crank’s rotation? In other words, what is the rotational relationship between the leading edge of the camshaft position square wave and the TDC of cylinder #1 on the firing stroke? In the MoTeC software, this critical number is specified in degrees of crank rotation. It is called the Crankshaft Index Position – abbreviated to CRIP. Without an accurate CRIP, the ignition spark will be incorrectly timed and the sequential injection will also not be correct. In fact, if the CRIP is greatly in error, the engine won’t even start. 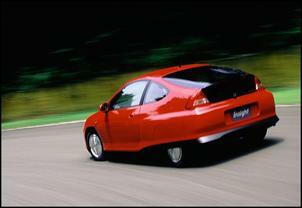 So how do you ascertain what the CRIP is for a particular engine – in this case, the Honda Insight’s three cylinder? With programmable management never before having been fitted to an Insight, the only way was to directly measure it. 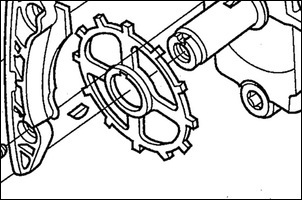 (3) The number of crankshaft degrees between Steps 1 and 2 above. To allow the number of degrees of crank rotation to be easily and accurately measured, I made a simple tool – a degree wheel. The first step was to go online until I found a downloadable, printable protractor. I specified its diameter to be just a little smaller than the crank pulley diameter, printed it out and then cut it to shape. The paper was then laminated, giving a reasonably durable and accurate tool at basically no cost. 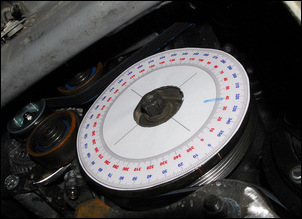 The paper degree wheel was then stuck to the crank pulley – I used gasket cement that was durable enough to allow the degree wheel to stay in place at up to 6000 rpm, but then pulled off easily when I no longer needed it. We now know what needs to be found out in order that the CRIP can be ascertained - let’s take each step one at a time. Unfortunately, on the Honda, the crank rotational position at which the camshaft signal is outputted could not be found electronically. Why not? Because until the engine is spinning fast enough, no signal is outputted! Instead, this position needed to be directly observed. It would be good if both camshaft position sensors could have been removed - then a visual check could have been made of when the two cam teeth were each opposite their respective sensors. Trouble is, on this engine that would have involved a great deal of work to gain access, especially to the rear sensor. By observation, Georgina could then ascertain where in their rotation were the adjoining teeth on the cam. By getting the pattern mentally worked out in this way, Georgina could then state when each tooth must be near its respective sensor – despite being able to see only one tooth at the position of one sensor. The crank rotates twice per firing stroke on Cyl #1, so how to find out when the cylinder was as TDC on its firing stroke, not exhaust stroke? I could have lifted the rocker cover and observed the valves directly, but a local mechanic (thanks Wayne of Dalton Garage) suggested an easier way. So the process was this. 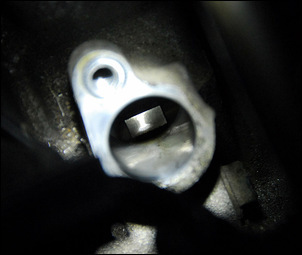 (1) Crank rotated until Georgina could surmise that the two cam teeth were each opposite their respective sensors (indicative of Miro Module camshaft sensor square wave output). In the case of the Honda, the CRIP was 694 degrees. 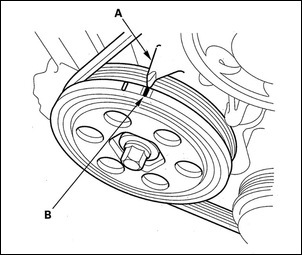 In other words, Top Dead Centre of Cyl #1 occurs 694 crankshaft degrees after the cam position sensor output first occurs. However, I’d be misleading you if I said that the CRIP can be ascertained to 1 degree accuracy in the way described above. It can’t – where, for example, do the camshaft teeth need to be, relative to the sensors, for the leading edge of the square wave to be outputted? One millimetre either way and the CRIP will then be wrong. However, the above process means that you can be confident that you have the CRIP well in the ballpark. With a timing light working with Cyl #1, the engine is then cranked. If the timing light doesn’t show 12 degrees of ignition timing (or whatever number you have set – 0 degrees would be another easy one to use), then the CRIP needs to be changed in the software. After the CRIP has been changed, the timing observed with the timing light will also change. The aim is to use a CRIP that gives a measured timing that corresponds to the ECU-dictated timing (in this case 12 degrees). In other words, an ECU-set timing of (say) 12 degrees actually is 12 degrees when measured with the timing light on the crank pulley. Fine-tuning the CRIP during cranking in this way will normally give accurate enough timing for the engine to run. When the engine is running, and so the timing light is firing more frequently, the CRIP can then be fine-tuned in 0.5 degree increments – this way, it can be set dead-on. Making the MoTeC M400 work with the standard Honda sensors (especially the dual camshaft sensors) and then measuring and setting an accurate CRIP were demanding and exacting tasks. The process also showed me that fitting programmable management to an engine that has not previously been thus equipped is a much bigger ask than fitting management to a well-known engine. 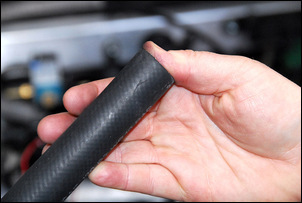 In the latter cases, set-up modes for reading the standard crank and cam sensors are already available, and the CRIP number is a known value that can just be plugged in. But all that is now in the past: the task now is to start the engine, sort out idle control and then start tuning.